Take Manning Avenue (Hwy 15) north to Settlers Way. Turn right on Settler's Way and then left onto New England Place. 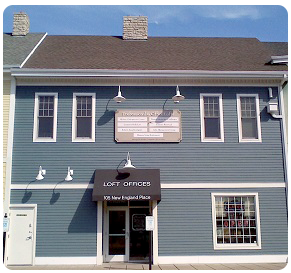 Our clinic is located within the Liberty Village Office Lofts, in the marine-blue building to the northwest of Kwik Trip. Park on the Manning Avenue side of the building for easy access to an elevator, if needed. Enter Liberty Village Lofts (door #105). Our clinic is in Suite 250, across from the elevator, on the second floor. Step 1: Call for an appointment at the clinic. Staff will help you find a time that works well for you and give you more information about the processes we use. Step 2: Fill out all patient intake paperwork before your first visit. Our staff will usually mail this to you in advance. Step 3: Attend your new patient interview where Dr. Wick will discuss your health concerns with you and determine if his services are a good option to address them. Step 4: Health examination by Dr. Wick to discover the functional components relating to your health concerns. This step may include referral for imaging (x-rays, MRIs, etc.) or laboratory testing. Step 5: Dr. Wick will report his impressions and propose the course of action he thinks will best optimize your health. Chiropractic care can provide benefits for a wide range of the population. It is acknowledged, however, that it may not be the appropriate care for all persons or all health conditions. The process outlined above allows for both patients and doctor to mutually decide on a beneficial plan.